Indian shooter Ravi Kumar won the bronze medal in men's 10m air rifle shooting event at Gold Coast. 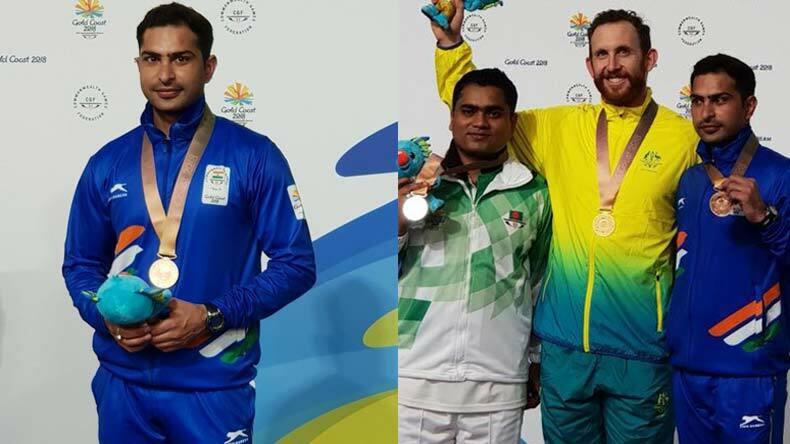 While the ace shooter from Meerut finished third with a total of 224.1, Bangladesh's shooter Abdullah Hel Baki came second with 244.7 which was improved by Aussie shooter Dane Sampson with a score total of 245. Ravi Kumar emerged victorious in the recently concluded International Shooting Sports Federation (ISSF) World Cup in Guadalajara, Mexico where he finished third and clinched the bronze for himself. The Day 4 of 2018 Commonwealth games belonged to Indian shooters and weightlifters as they bagged 5 medals in India’s medal tally. After Manu Bhaker and Heena Sidhu clinched gold and silver in their 10m Air Pistol event, Indian shooter Ravi Kumar won the bronze medal in men’s 10m air rifle shooting event at Gold Coast. The 29-year old fired a total of 224.1 to register his score behind Australia’s Dane Sampson, Bangladesh’s Abdullah Hel Baki at the Belmont Shooting Centre in Australia. While the ace shooter from Meerut finished third with a total of 224.1, Bangladesh’s shooter Abdullah Hel Baki came second with 244.7 which was improved by Aussie shooter Dane Sampson with a score total of 245. Ravi narrowly escaped a shoot-off with a score of 244.7 in the final. Over the years, Ravi has been considered as one of the exciting prospects in the world of shooting and his recent exploits speak better for the Meerut shooter. In the same event, Ravi Kumar emerged victorious in the recently concluded International Shooting Sports Federation (ISSF) World Cup in Guadalajara, Mexico where he finished third and clinched the bronze for himself. Ravi’s counterpart Deepak Kumar also made his presence felt but unfortunately failed to deliver for India on Day 4 of 2018 Commonwealth Games at Gold Coast in Australia. Deepak created history with his total of 627.2 at the Commonwealth Games to confirm his place in the final along with Ravi, who registered a total of 626.8. Deepak qualified for the main event at Gold Coast only to finish sixth with a total of 162.3. “4 years ago Ravikumar lost a shoot off to finish 4th. I told him his time would come! Congratulations to him on a well-deserved bronze!,” Abhinav Bindra hailed Ravi Kumar’s exploits on Twitter.